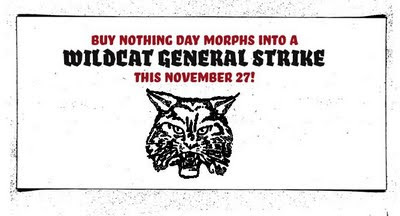 Turn Buy Nothing Day up a notch this year by joining the Wildcat General Strike! On November 27/28 we are asking you to claw at capitalism and sink your teeth deeper into the corporate machine. Buy Nothing Day (BND) was a radical concept when we first introduced it 20 years ago. It struck a blow against the very heart of our consumer culture. For the first decade of its existence it had a profound and sweeping effect, shining a light on the dark side of consumerism at a time when the world was largely oblivious to its insidious effects. Year after year it fired up the world’s imagination – inspiring its fair share of sympathy and solidarity, resistance and mockery. I remember people laughing their heads off at the sight of my BND button. But somehow, as the years wore on (and despite the fact that last year it was celebrated in 65 countries around the world), the day seems to be losing its edge. Now, as humanity faces crises of ecology, psychology and faith, the time has come to rethink the day, to reanimate it with new intensity, purpose and scale. This year we’re calling for a wildcat general strike. On November 27/28 we’re asking tens of millions of people around the world to bring the capitalist consumption machine to a grinding – if only momentary – halt. We want you to shut off your lights, your televisions and other nonessential appliances. We want you to park your car, turn off your phones and log off your computer for the day. We’re calling for a Ramadan-like fast. From sunrise to sunset, we abstain en masse. Not only from shopping but from all the temptations of our five-planet lifestyles. Instead we’ll feed our spirits and minds with a feast of subversive activities: pranks, shenanigans, credit card cut-ups, bicycle swarms, mall invasions and all manner of culture jams and creative détournements … and some of us will take things even further with sit-ins, demonstrations, passive resistance and acts of nonviolent defiance, anarchy and civil disobedience. If we can create a big enough ruckus on November 27/28, then we may be able to catalyze what the Situationists tried to set in motion half a century ago: a chain reaction of refusal against consumer capitalism … a sudden, unexpected moment of truth … the first ever global revolution. Buy Nothing Day is synonymous to the radical anti-consumerism movement called Adbusters, which has influenced my activism idealism since my involvement with Penang School of Thought particularly Consumer Association of Penang (CAP). Before this I have tried to persuade GAMIS and PKPIM to start this kind of Situationist movement that ties on Islamic principle but to no avail it has not become a reality yet. It is a simple yet radical campaign to let people think the current state of our lifestye and our planet at large. For more info about my view on this culture jamming (penggodaman budaya) activity please read my older entry entitled: Brainstorming the cause and effect of global economic crisis. dimana boleh saya dapatkan buku tahafut al-falasifah,dan tahafut al-tahafut..
Library. Kedai memang susah nak cari.